This is the sound of the two of us rolling and laughing our way down the Baja California Peninsula. Despite a giant fence and tightened U.S. border controls, the Tijuana border appears to remain as porous as ever. Only about one in ten vehicles were stopped at all, including ours. An agent had Miles open the bag on top of the bike and asked what was inside.. and that was that. He didn’t even look at our passports. 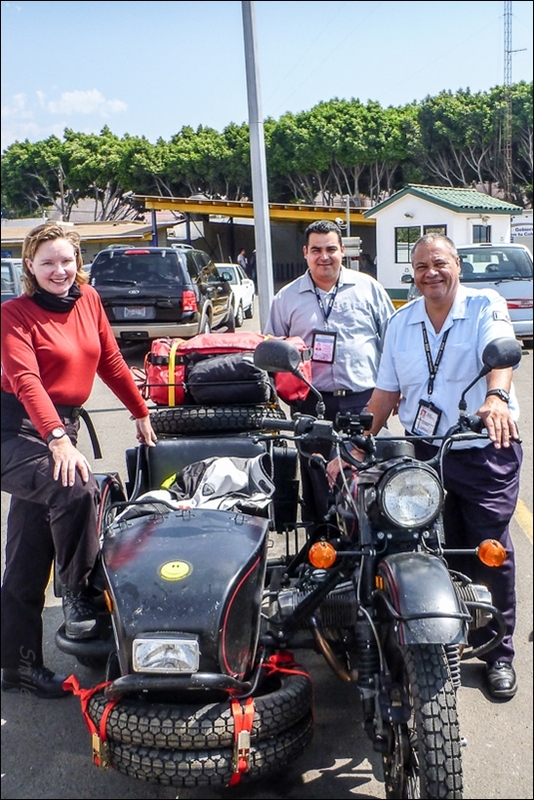 The official who handled our motorbike paperwork was a biking enthusiast and sped us through the remainder of our border crossing process so that he could come outside to look at the bike and pose for a photo. Tracey with our Mexican border officials. We were thrilled at the response that the Ural received along the road. Construction workers, truck drivers, children, military check point officials and many others all stopped to take a look and give us an approving wave as we passed. One of the advantages of traveling on a bike became clear as we noticed the ever-changing smells on this route – from sea water to fish to the pungent scent of a cantaloupe that lay smashed on the road. In a few spots along the highway, the road was ripped up for construction and we got a taste of off-road riding on the Ural. “Wheeeeee!” Otherwise, the highway was so smooth and the curves so well designed that it was a fantastic experience, easily rivaling the best roads in the world. In the tiny village of San Vicente we were greeted with enthusiasm everywhere we went. It seemed that we were the only tourists in town and they made us feel so welcome that we couldn’t help staying the night. 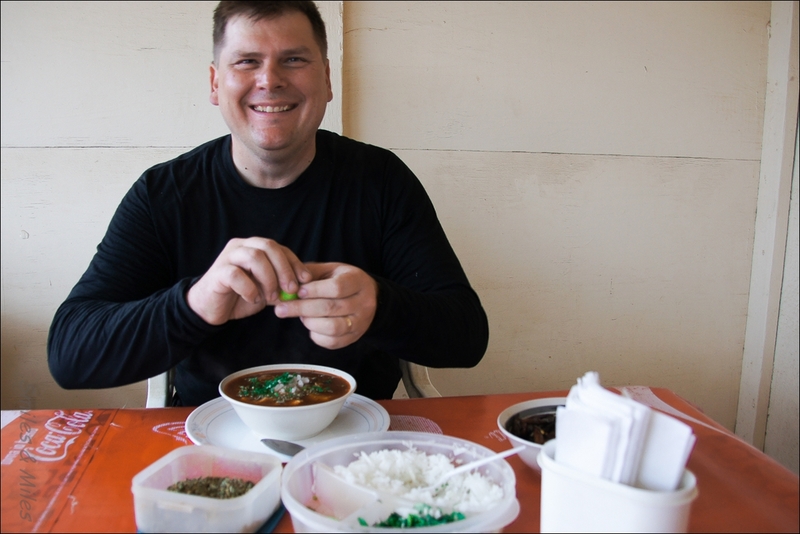 In the morning Miles had the chance to enjoy one of his favourite dishes – menudo. 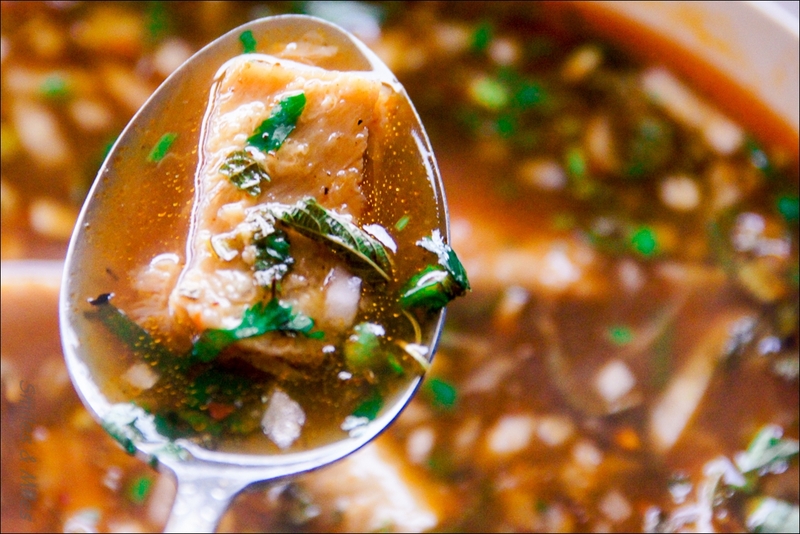 Miles enjoying a bowl of menudo. Just south of San Vincente we began to see several cactus farms, followed by tomato farms, followed by the untamed stretches that make up the majority of Baja. 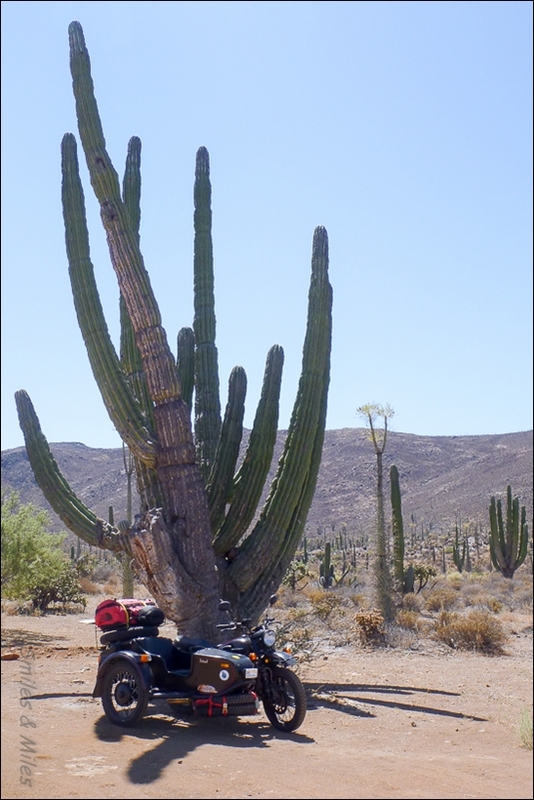 The Transpeninsular highway snaked into the Desierto Central with its wild landscapes of giant boulders, towering cardon cacti and bizarre cirio trees. 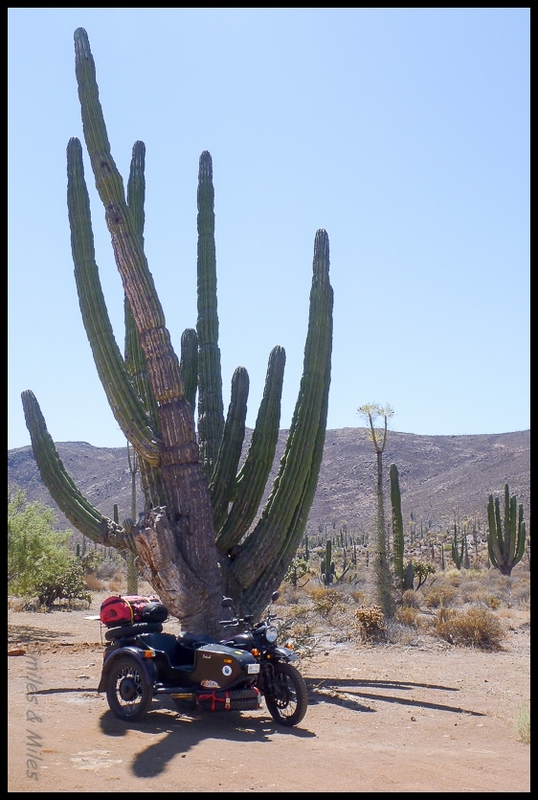 The Ural enjoying the shade of a giant cactus. This is where we passed a well-equipped cyclist, Jorge Guerra. 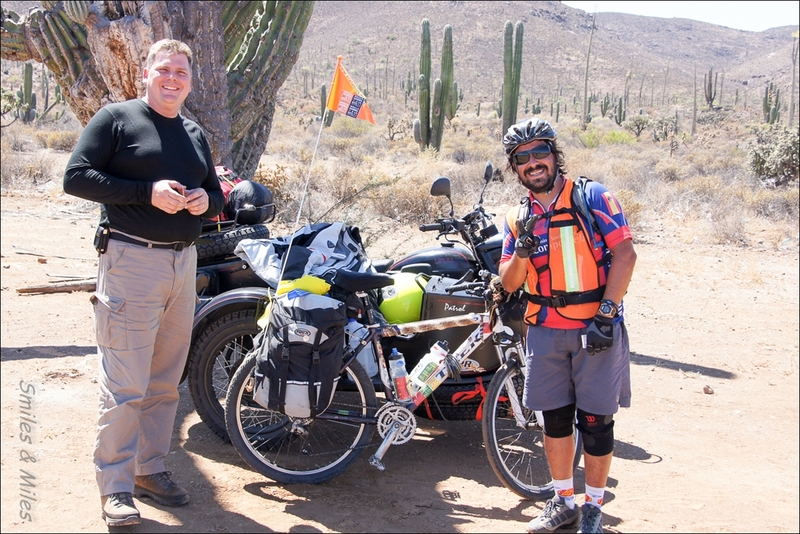 Tempted by our offer of drinking water and the shade of an enormous cactus, he stopped for a chat and told us of his trip from Mexicali to Cancun to promote peace in Mexico and to encourage more Mexicans to ride bicycles. Jorge’s bike was adorned with a lock of his girlfriend’s hair (for luck) and a rattle snake skin that he found on the road, including the rattle. 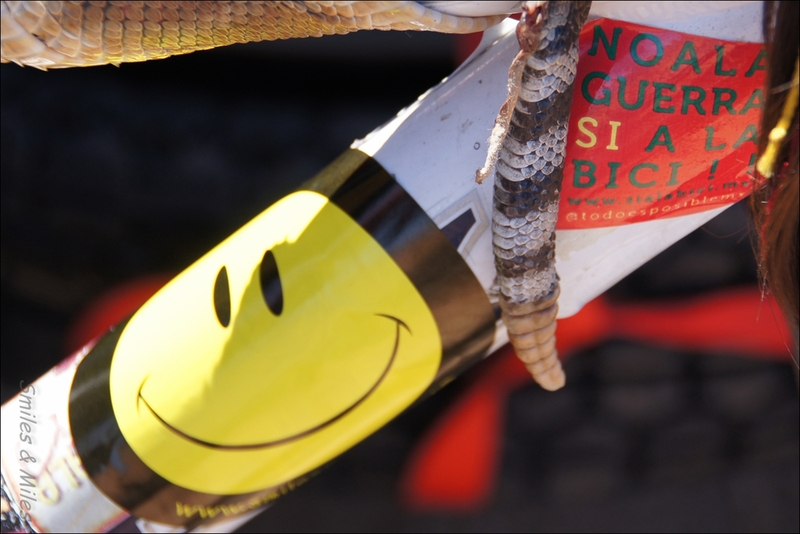 The Smiles & Miles logo keeping company with a snake skin for a trip across Mexico. His energy put these two motorized travelers to shame. The scenery for our final drive in Baja was endless stands of cacti and mesquite trees against a backdrop of jagged peaks with spectacular views over the sea. We arrived at the ferry terminal in Pichilingue to discover that there was a ferry leaving two hours later. We bought our tickets and were on our way to the mainland. We met many people on the ferry. People would approach us and say “I saw you in Ensenada” or some other location along the way. After several limonatas and spirited attempts at Spanglish it was time for a sleep on a bench in the cafeteria, the only place that was cool enough to sleep.